Over the last few days we’ve made some shortish trips to a couple of nearby beaches to help blow away the winter blues and to find free food! The best times for foraging on the beach is at low tide. Neap low tide especially, which is every quarter cycle (half moon). You also want to pick a beach where there are no dodgy looking streams/sewage running into the water, although I think most beaches down here in cornwall are fairly clean. As with fishing, and anything else, we don’t harvest little creatures, and we don’t harvest greedily…just take what we need and treat the beach and it’s creatures with respect. 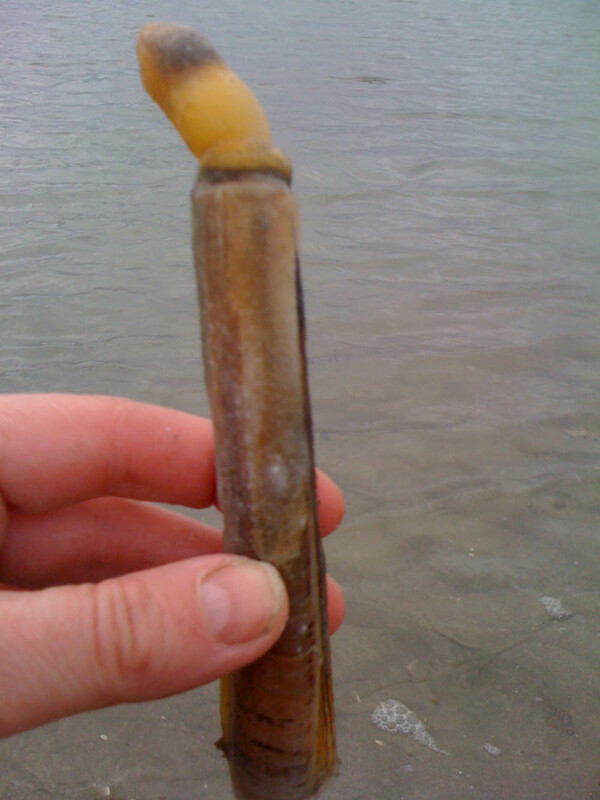 What we are really looking for is razor clams. They (apparently) live on sandy beaches and can be found by the shoreline on very low tide. They have lots of meat and are commonly eaten in other countries. You look for a keyhole shaped hole in the sand, sprinkle some salt on it and up pops one of these creatures. A great free source of protein and it is tasty. I think you can cook it similarly to a mussel and it has MUCH more meat on it. However, on our 3 hunts so far we have not found one. Wrong beaches maybe? We’ll try another beach tomorrow! I took this rather rubbish video clip on my phone yesterday. The wind was blowing so hard and it was bloody freezing, but so worth it as we got a wonderful harvest of mussels and seaweed. So in the bits you probably couldn’t hear/understand, I was pointing out all the mussels on Porthmeor Beach at low tide. We made a risotto/paella type thing for supper with mussels and they were yum!! We steamed our mussels until their shells open – about 5 minutes (if their shells do not open, you should not eat them). Lovely with just a garlic butter trickled over them too. 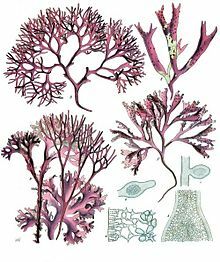 The other thing I’ve also just started collecting is Irish Moss (aka carrageen) and sea lettuce. They are seaweeds found clinging to rocks and in rockpools on low tide, very common. Irish moss is now thought to contain 15 of the 18 essential elements that make up the human body. 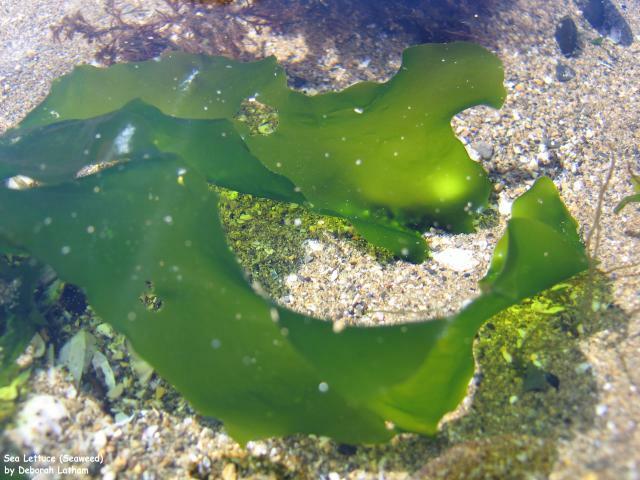 This includes great amounts calcium, iodine, sulphur, and potassium as well as Vitamins A, D, E, F and K.
Sea lettuce is very high in iron; high in protein.. Also high in iodine, manganese, and nickel. Considerable dietary fiber like most of our sea veggies. It is bright green, small and kind of slimy. You need to rinse it well to get rid of any sand. 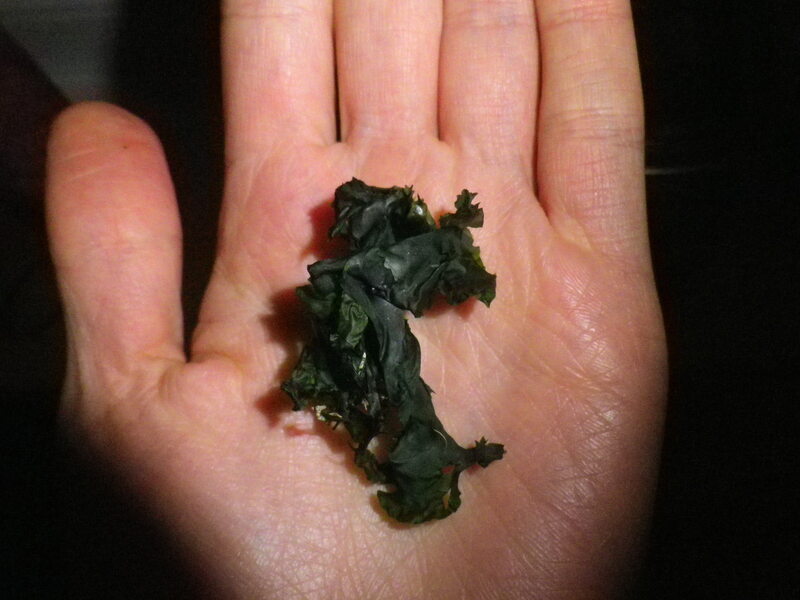 All seaweed also contains iodine which is great to combat our frequent exposure in this day and age to radiation from xrays, scans, radiation leaks, etc. If you have a dehydrator, this would be perfect for drying seaweed. I, however, just put it on the lowest possible heat in our oven for a few hours, occasionally turning it so that the moist bits at the bottom dried too. This is how it looks now and is all crisp and ready to be sprinkled in soups and on salads or stirfries, or in anything really. During one of our foraging trips, we decided to try limpets. You have to sneak up on them and give them a quick knock with a rock or something before they realise you’re there, otherwise you won’t get them off the rock. I carried a few of these in my hands and their feelers/eyes came out as if they were looking for an escape route. A serious feeling of disgust in myself for thinking I have the right to take the life of another being swept over me, accentuated by the guilt of knowing what I know having been vegan for over a year – that I don’t actually NEED to eat them to survive. Still, I brought them home. But with the knowledge that I (probably) won’t ever eat proper big meat again. 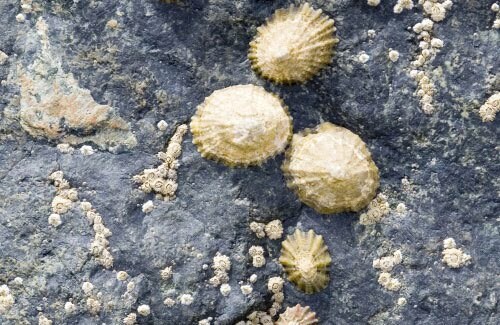 If I struggled facing a limpet, I couldn’t possibly kill my own lamb, cow or pig. And I do believe that if we’re going to eat things, we should at least be able to kill them ourselves. Anyhow, I digress, the clams (which you have to soak overnight in salty water) were then put into the pot by Steven. Alive. I couldn’t do it. (I can with mussels..as you don’t actually see them moving, do you?! I guess I’ve conned myself into thinking they’re not alive) We cooked them until they came out their shells and then we had the lovely job of twisting their head and guts off the main meat part, and then – to my utter disappointment, and kind of relief, they were really tough and flavourless. So we tried cutting them up and frying them in a little garlic butter…but by then they were inedibly tough. Apparently they are a bit like calamari and it is possible to cook them to be tender. If there’s a next time, which I doubt, we will try them in a stew or something! Another recommended way is making a fire on the beach and putting them straight onto a hot rock or spade and eating them straight out the shell once they start bubbling. You can eat them raw too, but I couldn’t…it’d be too much like eating a raw snail. So, I hope none of this has put you off and you are at least inspired to collect some fantastic seaweed! The girls just love looking for crabs and gobi’s and things in the rock pools too! Obviously we don’t eat them, but we probably would if they were big enough!! !